All the latest Archangel press releases, events, and articles. Archangel Systems is pleased to announce its successful achievement of ISO 9001:2008 certification. This milestone offers independent confirmation of Archangel's commitment to developing & manufacturing inertial sensing equipment which is both accurate and reliable. According to Ron Turner, Archangel's Director of Quality, "The ISO quality management system is a comprehensive set of documented policies, procedures, and processes that comprise management's commitment to quality in all the company's activities. Archangel's Quality Objectives are as follows: "To Meet or Exceed Customer Quality & Safety Expectations in These Key Areas: 1) Customer Satisfaction, 2) Product Performance, & 3) Continuous Quality & Product Improvement". Archangel Systems, Inc. is a private, closely held Alabama Corporation, headquartered in Auburn, Alabama. Formed in 1992, the company specializes in Inertial Sensing Systems & Solutions for Aerospace, Automotive, & Military Applications. Areas of expertise include sensor development, hardware & software development, as well as FAA certification of both hardware & software to the highest levels of criticality. For additional information, please visit www.archangel.com. According to Dr. Katherine Greene, Archangel's President, “There is a critical need to prevent rollover of Light Tactical Vehicles (LTV’s) used by military personnel. For example mine-resistant vehicles (MRAP) used by the Marine Corps and Army have experienced more than 230 rollovers between November 2007 and January 2010, resulting in 13 fatalities. In commercial markets, more than 20 armored cash transport truck rollovers occur annually. V-PRO is designed specifically to reduce the number and severity of these events”. 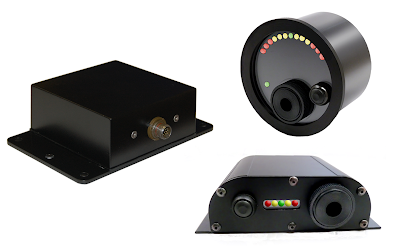 Archangel Systems, Inc. is pleased to announce its new Air Data Attitude Heading Reference System (ADAHRS), the AHR800. Based on the certified AHR150A & AHR300A systems, Archangel has further developed an ADAHRS that can support applications in high speed, high performance jet aircraft. The AHR800 system is capable of measuring airspeeds up to and including 850 knots indicated. The AHR800 system consists of two boxes. The AHR800-1 Inertial Sensing Unit (ISU) senses rate, acceleration and air data, while the AHR800-2 Magnetic Sensing Unit (MSU) is a remote three axis magnetic field sensing device. Together these two components provide a powerful and cost effective alternative to other gyro systems. The AHR800 is currently in final development and testing. Deliveries to the AHR800’s flagship customer will begin during last quarter 2012. For further information on the AHR800, contact Bill Dillard at (334) 826-8008 x14 or via our website. For further information on Archangel’s products, contact Bill Dillard at (334) 826-8008 x14 or via our website. Archangel Systems, Inc. is pleased to announce that it has received an Air Agency Certificate (CRS# 9AYR875B) upon finding that its organization complies in all respects with the requirements of the Federal Aviation Regulations relating to the establishment of an Air Agency, and is empowered to operate an approved Repair Station. All of Archangel’s technicians complete extensive training in areas such as: Human Factors, Technical Data, Situational Awareness, the Repair Station Manual, and Facility Security courses, in order to enhance the overall level of quality that Archangel delivers to their customers. The recently certified repair station will be headed by Bob Caudle, Production Manager. The AHR50 can operate as a standalone Inertial Measurement Unit (IMU) providing body and inertial angles & rates with a maximum gyro rate of + 150°/s & an altitude ceiling of 52,000 feet. When connected to Archangel’s AHR150A-2-A Magnetic Sensing Unit (MSU), the AHR50 becomes a complete AHRS with both attitude & heading output data. Information on the AHR150A-2-A is available at www.archangel.com. The AHR50 was designed for two missions. The first is for embedded applications where the host system provides EMI / EMC & input voltage protection. With Level A software & DO-160E certifications for remaining categories, the AHR50 is ideal for primary flight system designs. Second, impending FAA equipment requirements for UAS platforms operating in the domestic airspace will require some level of software certification. Since both the AHR50 & the AHR150A-2 MSU carry Level A certifications, the combined system meets all possible scenarios. All customer data interfaces are via a single RS232 port with input & output data defined in the AHR50 ICD (User must confirm this is latest Rev. prior to use). The input port has two functions. First, during setup, commands for in-field magnetic compass calibration, orientation (8 options) & lever arm corrections are defined. Second, during operation, directional gyro (DG mode) heading select & compass slewing are received through the RS232 port. In addition, the ICD supports an air data message input. If received, the AHR50 blending algorithms can achieve FOG-equivalent attitude performance & echo the air data to downstream systems. Software customizations for other sensor inputs can be developed by Archangel. Archangel Systems, Inc. is a private, closely held Alabama Corporation, headquartered in Auburn, Alabama. Formed in 1992, the company specializes in Inertial Sensing Systems & Solutions for Aerospace, Automotive, & Military applications. Areas of expertise include inertial sensor research, hardware & software development, as well as FAA certification of both hardware & software to any DAL criticality level. For additional information, please visit www.archangel.com. The Boeing Company has selected the AHR150A ADAHRS from Archangel Systems for Project Julius. Under the program, Boeing UK will modify 38 Mk2/2A Chinooks into the Mk4/4A configuration and eight Mk3 Chinooks into the Mk5 configuration—providing essentially new aircraft to the UK MOD. A dual ship set of Archangel AHR150A ADAHRS provides the attitude, heading and air data solutions to a Thales-based cockpit. The deciding feature of the AHR150A in Boeing’s evaluation process is its low-noise inertial vertical velocity measure—critical to heavy lift aircraft operations. The AHR150A is a new paradigm ADAHRS that combines MEMS sensors with DO-178B Level A software and rigorous DO-160E categories consistent with high vibration environments and wide temperature variations. The AHR150A also is approved for composite body aircraft. To support fly-by-wire applications, data latencies are low to maintain adequate flight control loop stability. In addition to the Chinook Julius program, the AHR150A is used in a wide variety of applications from Citation 7 aircraft to the Erickson Air-Crane. For further information on Archangel’s products, contact Bill Dillard at (334) 826-8008 x14 or via our website.